Have you been watching any of the recent football games? Even the games that don’t involve my favorite team have been super exciting. It’s all leading up to the big game and that means I need to get planning my game day spread. I love making a snacks for football games, especially when we have a lot of people over. I’ll be having a winning game day party with Idaho® potatoes. I only use Idaho® potatoes because unlike potatoes from other states, Idaho® potatoes are available all year long. They also produce fluffier baked potatoes with a bright, white interior and more potato flavor. 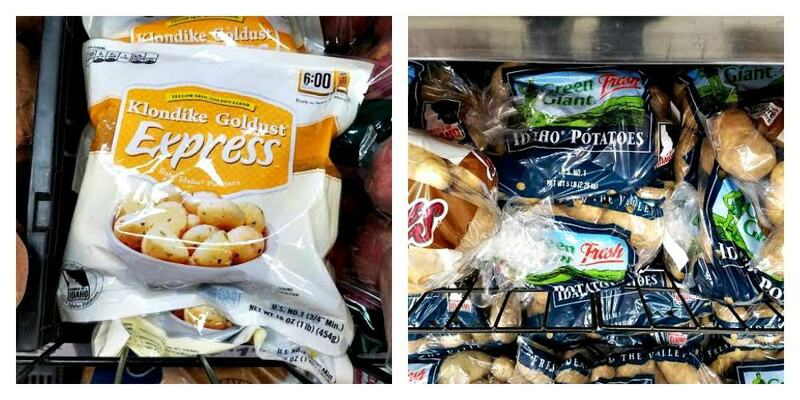 Plus, Idaho® potatoes have a high solids content which means there is more potato and less water. This leads to a light, fluffy texture as well as a full and firm appearance. So what am I making with these potatoes for game day? I’ll be making Pulled Pork Potato Skins. These are seriously the best snack food around. They are filling, bursting with flavor, and are great for feeding a crowd. I first had these Pulled Pork Potato Skins at one of my favorite local restaurant. They had them as an appetizer special one night and I just had to try them. My first bite was pure bliss. The potato skins are salty and firm enough to hold up to plenty of filling. The filling itself is pulled pork, cheddar cheese, cilantro sour cream, and green onions on top. The combination is amazing. 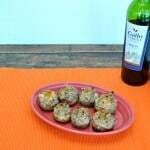 As soon as I got home I set about recreating this recipe because I knew they would be a huge hit for game day. I picked up a bag of golden Idaho® potatoes because I find they have a subtle buttery flavor and great texture. They are also a great size for making potato skins that aren’t too big to eat for a snack. The great thing about this recipe is that you can use already made pulled pork. 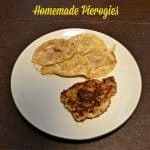 So if you make a lot of pulled pork on Friday or Saturday you can simply use the leftovers to make this easy game day snack. I like to cut my potatoes in half before baking them so that they bake faster. I also like to spread them with a little bit of butter and a sprinkle of salt before they go into the oven. After the potatoes have baked it’s time to start topping them. I like to pile on the pulled pork and then add a generous helping of cheddar cheese. I pop them back in the oven just until the cheese melts and then pull them out and top them with sour cream and green onions. They smell amazing and look pretty too. They are seriously the best snack for football watching and now you have the recipe just in time for the big game! Want to keep the party going with more Idaho® potatoes recipes? One of my favorite football snacks using Idaho® potatoes is a poutine bar. I like to make piles of fresh Idaho® potato French fries and then lay them out with a variety of toppings like gravy, cheese sauce, cheese curds, bacon, green onions, and even pulled pork or fried chicken. 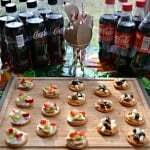 It’s an easy way to set up a food bar and will ensure everyone gets exactly what they want. If you are having vegetarian friends over it’s easy to make mashed potato bowls topped with broccoli and cheese, roasted vegetables, or black beans and cheese. 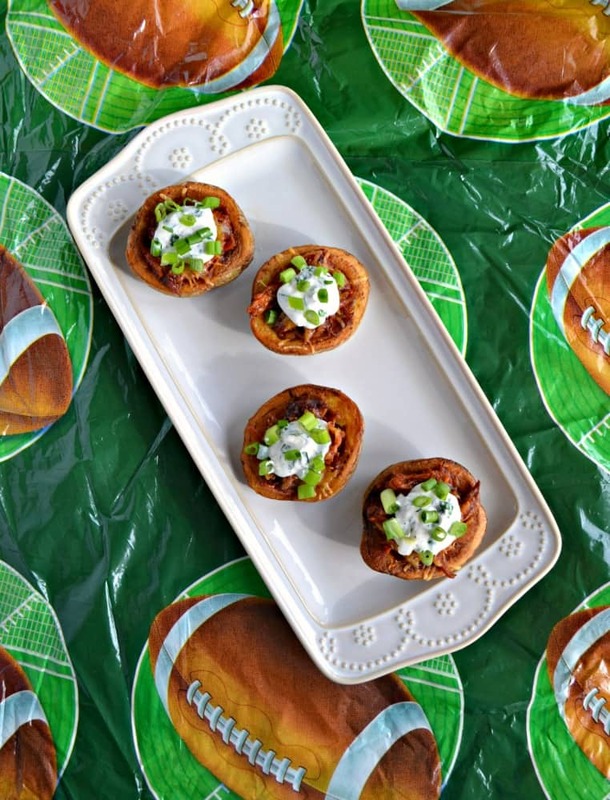 Delicious Idaho® potato skins stuffed with pulled pork, cheddar cheese, and cilantro sour cream. Preheat the oven to 400°F. Line a cookie sheet with foil. Slice the potatoes in half lengthwise. Brush the potatoes with half the butter and sprinkle with half of the salt. 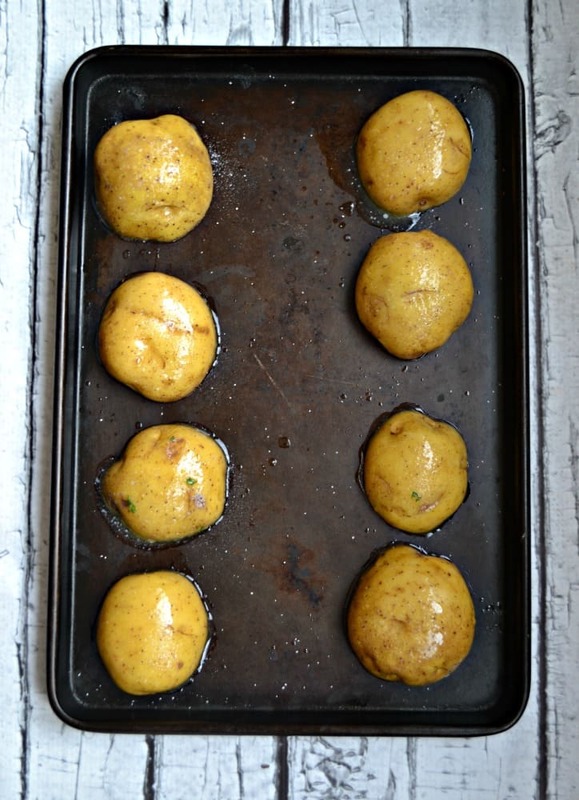 Place the potatoes cut side down on the baking sheet. Bake for 25 minutes. Remove from oven and let cool 10 minutes. Using a large spoon, scoop out the center of the potato leaving about half an inch of potato left in the skins. Increase the oven temperature to 450 degrees. Place the potatoes back on the pan, cut side up, and brush with the remaining butter. Sprinkle the remaining salt inside the potatoes. Bake for 5-7 minutes. Remove from the oven and divide the BBQ pork between the potato skins. Make sure to put a decent amount in each potato. Then top each potato with 2 tablespoons of cheddar cheese. Put the potatoes back in the oven for 10 minutes or until the cheese is melted and the pork is warm. Remove from oven. Meanwhile, mix together the sour cream, cilantro, cumin, and black pepper. Mix well. Once the potatoes are out of the oven top each one with 1-2 tablespoons of the cilantro sour cream and then sprinkle with green onions. Serve immediately. 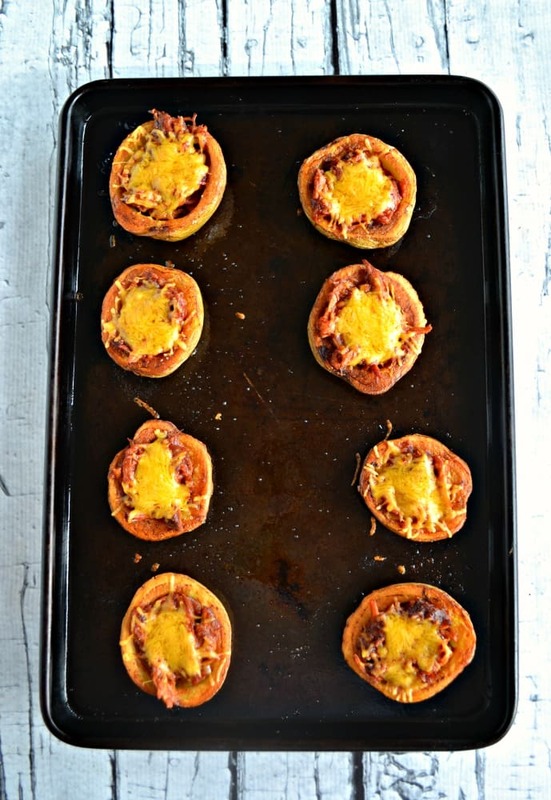 I love potato skins but never made them…. this looks fantastic with the pulled pork. Can’t wait to try them! Wait….cilantro sour cream? That’s genius! Love the look of these. I am coming to YOUR party this year! Nice being at the spud football buffet with you! I need to make pulled pork just to have leftovers for your potato skins! These look fantastic! Love how easy these potatoes are! I can imagine the pulled pork goes so well in here – yum! These skins are perfect for filling. Pulled pork sounds so good in here. 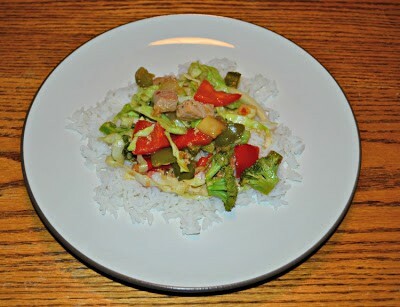 Your sour cream with cilantro works well with the pork! I may not know much about sports, but I know a heck of a lot about game day eats. And this recipe is at an All-Star status. I mean seriously, pulled pork AND potato skins in one? Who wouldn’t fall in love!? I think you’ve pulled together a nice meal here. Everything seems to work well together, the pulled pork and potatoes. 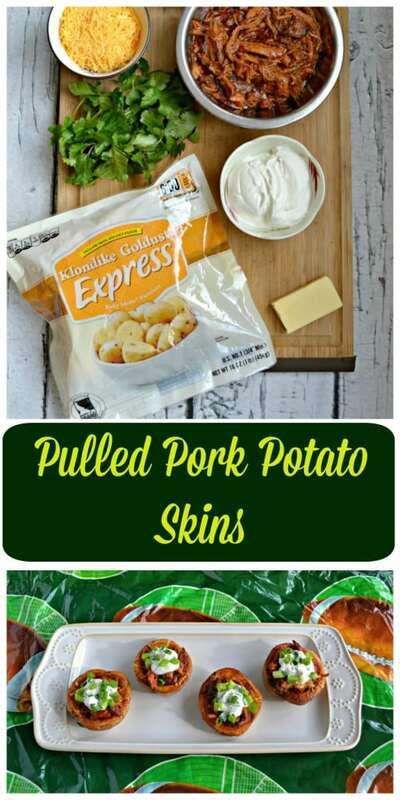 Pulled pork in potatoes is one of my newest favorites, so I adore these skins! Wow! This would be a big hit in my house! 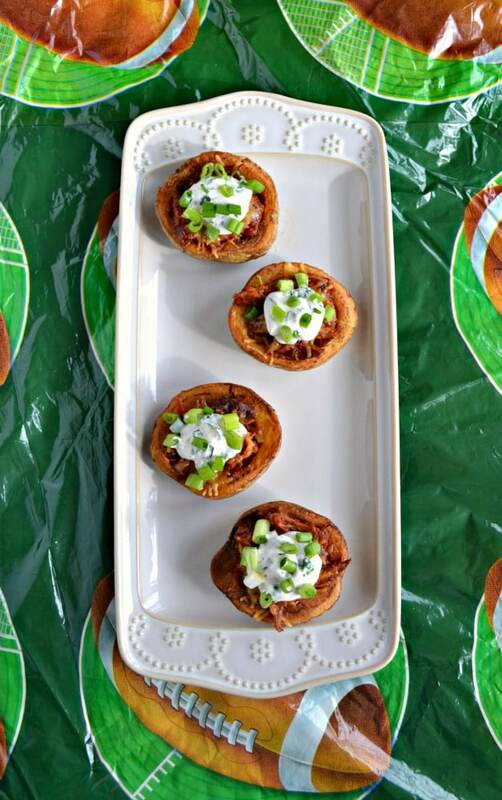 We love pulled pork and potato skins but never put them together. Great flavor combo! Thanks for sharing, Heather. I had them at this great restaurant and knew I had to recreate them at home. We love them! 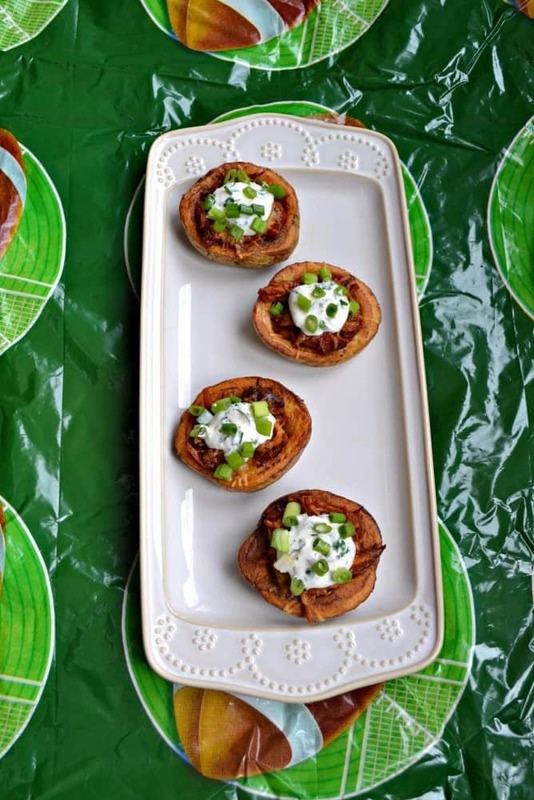 pulled pork + potato skins sure sounds like a wonderful combo to me! These look really delicious! My family would love them!